Firstly a very warm welcome to my new followers ~ welcome on board! How is everyone coping in this heatwave? I love this weather, but it is a little restrictive with the dogs, no nice long walks ~ they start panting just going 'round the block'. I have ordered a doggie paddling pool for them, so that is sure to end this current period of nice weather ~ lol. July has been a busy month here, I have had two extra dogs Ella & Phoebe Beardies here for a week while their Mom & Dad went on holiday and at the same time my Dad and Stepmom came for an extended weekend visit. The hot water system packed up for a second time, necessitating a visit from our Plumber to fix it and now the extractor fan in the bathroom has decided to go part time and only works 50% of the time you switch it on. We have had so many things break down or need fixing this year (the worst by far being Sorrell's little incident ~ see THIS post for details) ~ I have a feeling we will be glad to toast a fond farewell to 2013 at the end of this year. 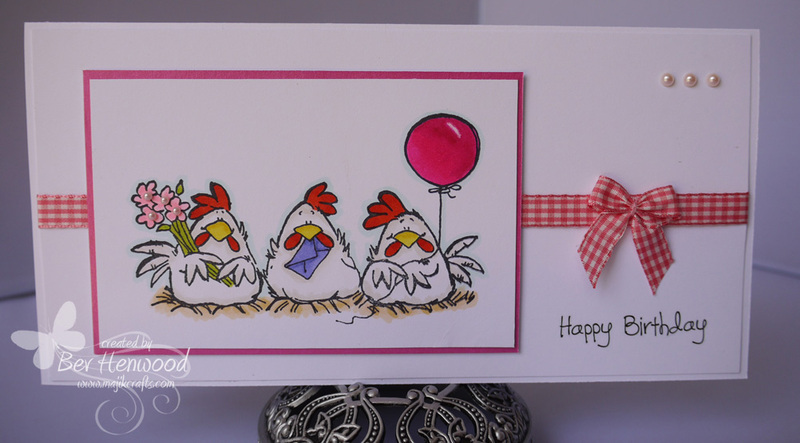 Enough of all that, on to todays share which is a Birthday card for someone who keeps chickens. I love Penny Black stamps and have more than I care to mention ~ doesn't stop me buying more though! Ribbon (which is pink not red): Fantasia Premium Ribbon & matching pack of Bows in Pink Fantasy (very handy)! Thank you so much for stopping by today and for any of your lovely comments. Sorry to hear of all your things going wrong but at least if you get them all out of the way this year, you can look forward to a better one next year!!! Glad everyone is okay though and it's only material stuff that can be replaced that's broken!! Fraser is really, really hot too, only he doesn't like the water either, he walks round puddles!!! So I know a little pool wouldn't be any good at all, he'll probably just drink out of it!!! Lovely card, and yeah Penny Black do make some lovely stamps. What a lovely chickens. I love this stamp and you made a lovely card with it. This is a fabulous image and I love the CAS design.